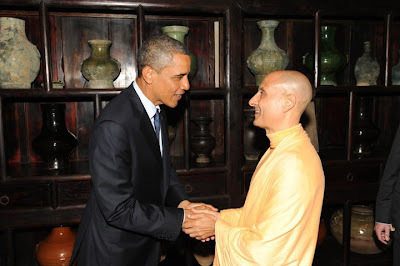 On June 13, 2011 Srila Radhanath Swami Maharaja was invited to meet with the President of the United States, Mr. Barack Obama at an event in Miami Florida. Radhanath Swami was grateful to accept the invitation on behalf of his beloved Guru, Srila Prabhupada and dedicated the meeting to his beloved Godbrother Bhakti Tirtha Swami. The President and the Swami had a beautiful, heartfelt talk for several minutes.